I LOVE making a good smoothie. And although I usually just make a Daily Harvest smoothie, I do love to make my own combos on occasion and realize I never share the recipes on here! 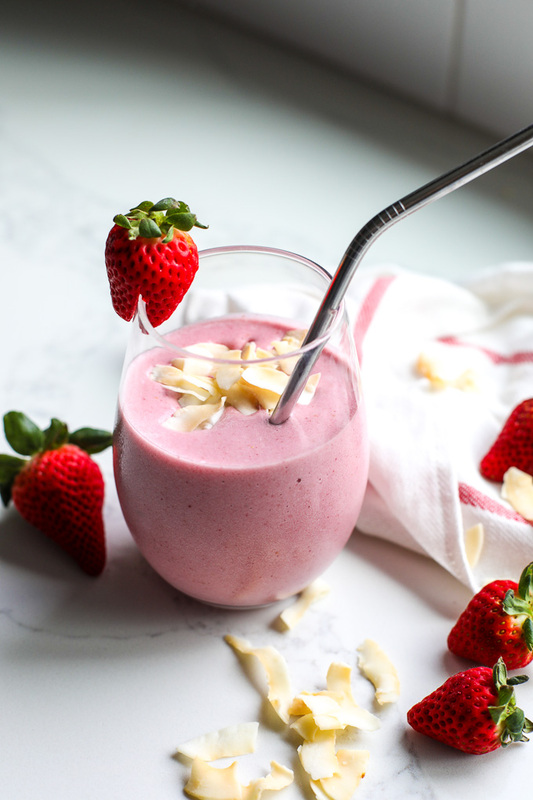 As cauliflower has been the hottest veg to put in everything as of late, Adding them to smoothies has become a new and great way to bulk up a smoothie without adding more fruit/sugar. 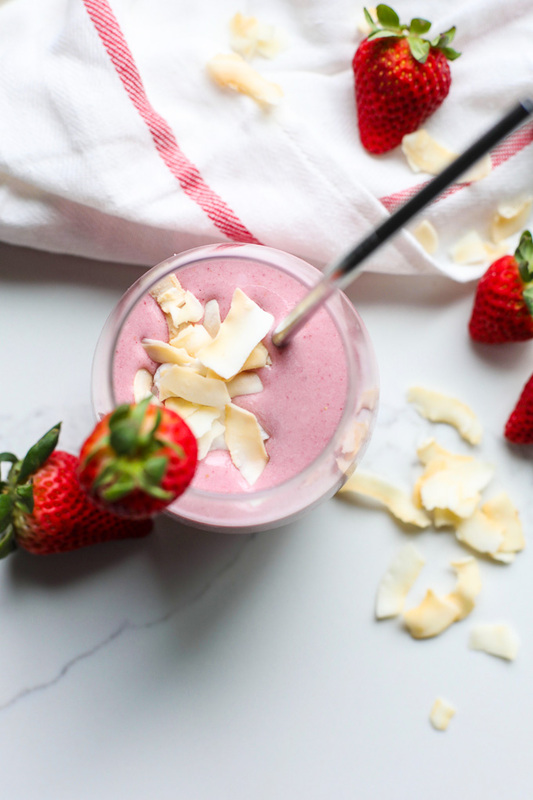 So I made sure to slip some in this Strawberry Coconut Smoothie – promise you can’t even taste it! 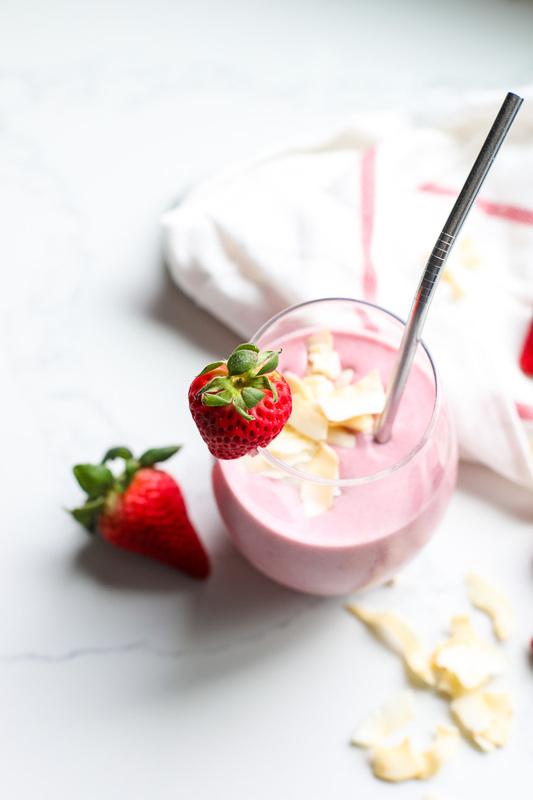 This drink is perfect for anyone – it just tastes like strawberries and cream deliciousness so kids should love it too. Is it weird that I am already thinking what recipes would be kid friendly?! My unborn child probably won’t be having smoothies for another year or so but I gotta be prepared right? I feel like I am doing something daily to prep for baby girls arrival – i’m just getting too excited! We have been building our registry and putting her room together piece by piece. I have a feeling it will all be prepped a good 2 months before she gets here because i’m just that excited. I also want to have everything ready because I have no idea how I will be feeling at the end of this pregnancy! You hear stories about people being on bedrest or terribly swollen ankles or something else that prevents you from being super active at the end – so I am all about this prep! I’m also going a little wild and researching/ reading about sleep training already… just trying to be prepared while fully knowing we won’t have much control once she makes her entrance. Okay, enough about me and the baby that is coming in in a mere 18 weeks and 1 day… let’s talk smoothie! Toasted coconut chips are so great for a crunchy topping if you like to eat your smoothies with a spoon! 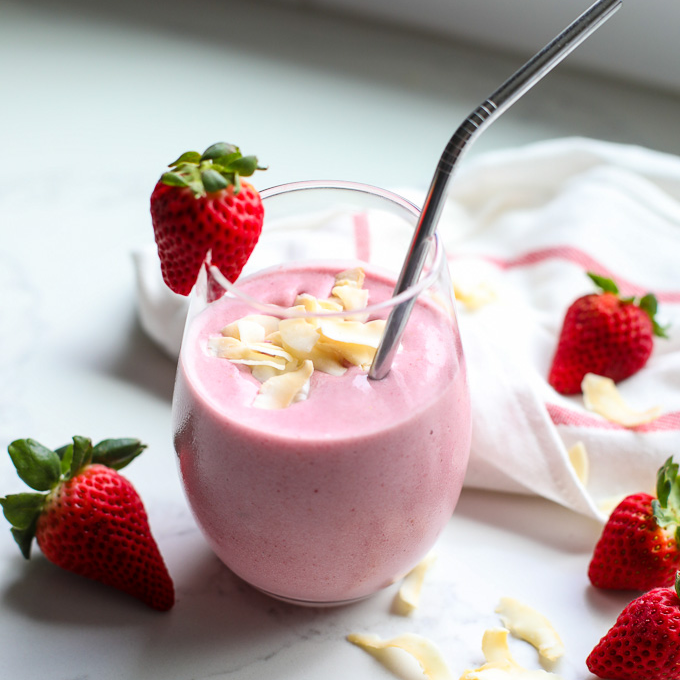 Pin the photo below to save this Strawberry Coconut Smoothie for later! Combine all ingredients in a blender and blend on high until smooth and fully combined!